The intertidal ecosystem of Barr Al Hikman in the Sultanate of Oman is one of the last large pristine wetlands in the Middle-East. Barr Al Hikman is of major importance as a nursery and feeding area for shrimps, fishes, crabs and green turtles and the most important wetland for shorebirds in the Middle-East. Our representative top predator in the Barr Al Hikman ecosystem is the iconic crab plover. Barr Al Hikman is home to approximately 9000 crab plovers, which is roughly 10% of the world population. In our project we ringed and tracked crab plovers during many years. Ringing data enables us to make predictions about the population developments of this species. 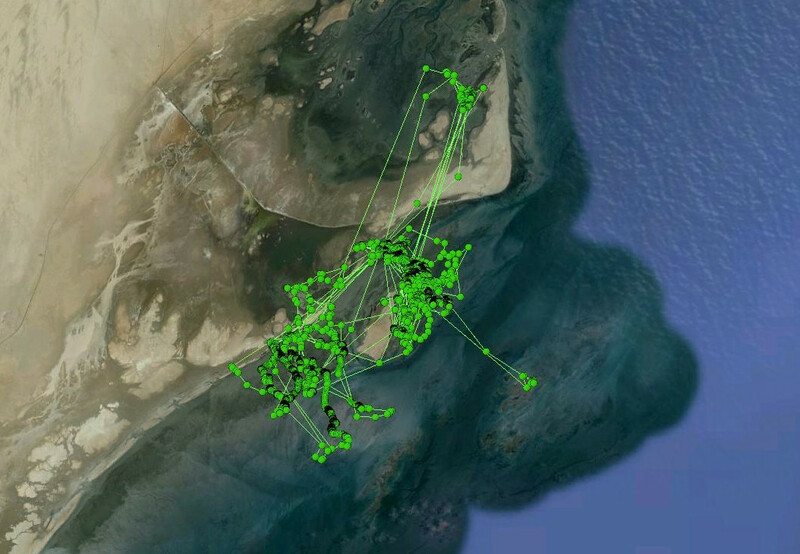 Tracking data can not only lead us to the origin of the breeding grounds of the crab plovers, but will also serve to study habitat use of the species and how they cope with variation in food conditions in a changing world. As for the satellite tracking we collaborate with UvA-BiTS. With our study we aim for an advanced understanding of the ecological processes that are shaping this unique system. By sharing our results we hope to raise awareness of the international importance of ecosystems such as Barr Al Hikman.